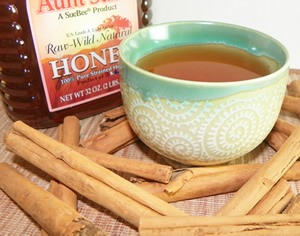 Cinnamon makes a great tasting tea alone or added to almost any herbal tea blend for it's spicy, warm properties. The addition of honey brings out the organic sweetness of the cinnamon and complements the antibiotic healing for colds, sore throats, and other viral infections. Recipe Instructions: Decoction :One teaspoon of small chips per 1 cup water, or break up a small to medium stick per 2 cups water, simmer on low heat, covered. Use organic cinnamon chips or sticks for best results. Finely ground cinnamon powders tend to make tea cloudy.